Long time no see. 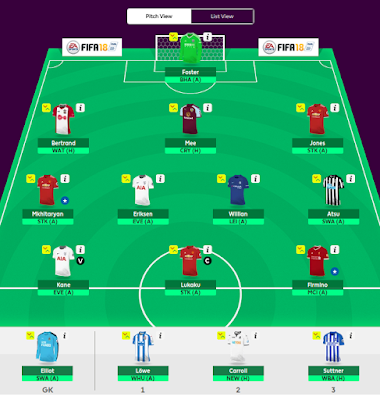 I have not been away, just behind the curtain and wanted to first quickly share with you my new site Fantasy Football Cloud. One of the things on the site I am most excited about is the "Top Players" section. This is based on the squads of the best fantasy football managers ever - or at least over the last 5 seasons. Similar to what FFGeek does in his weekly post Analysing the teams of theTop 10 FPL Managers, I gather team data from the 50 managers with the best record I can find over the last 5 seasons and aggregate this into players ratings. I started doing this around the GW21 mark last season and basically the team could do no wrong. Consistently, week after week after week, it got a green arrow. So I am excited about it. Based on these rating I have just entered an aggregate team into FPL (just now) and that actually is the main point of posting today. Admittedly at a slight handicap due to missed price rises but I can't help that now so let's see how she does. If you head over to the site you'll see the the Top Players section is organised into a rough team structure via position and price bracket. There also the "Team" option so I've tried to follow that with the team I have entered. Captaincy will be based on the polls. Anyway, enough rattle, here is the team. Let us see how she fares!